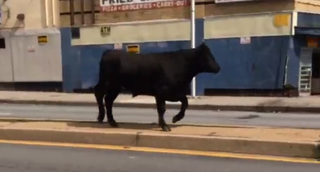 A bull got loose in the streets of Baltimore today. Nobody is sure where the bull came from, or where he was trying to go. All we know is that the bull was spotted by many Baltimore residents, running across the hot pavement of the city's roads, warmed by the summer sun and driven onward by the thrill of freedom. The Baltimore police department eventually caught up to the bull. The police shot the bull dead. Mourn for the Baltimore bull, but do not forget him. Inside all of us, he runs still.